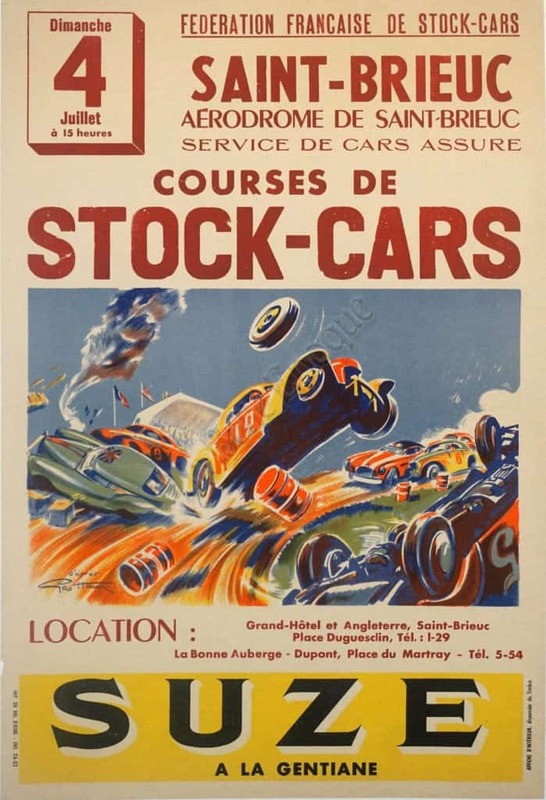 Advertisement for Stock-Car racing at the aerodome in Saint-Brieuc on Sunday July 4th, 1954 @ 3pm. The race was sponsored by both the French Federation of Stock-Cars, as well as by ‘Suze a La Gentiane’. Suze is a apertif (after dinner liquor) and it has a citrus taste. The poster has red All-Caps letters, and a very hectic 50s stock-car race, straight out of a movie. On the bottom, the sponsor Suze is in black letters in front of a yellow backdrop.